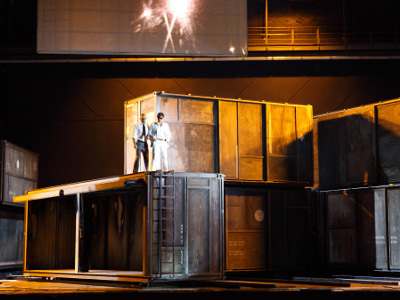 MUNICH — Ádám Fischer keenly propelled a revival here last night (May 3) of Stephan Kimmig’s 3½-year-old, shipping-container staging of Don Giovanni for Bavarian State Opera. Predictably the music fared better than the dramma. Hanna-Elisabeth Müller brought an evenly produced, warmly intoned Zerlina. After a tenuous start coping with leaps, Annette Dasch’s voice settled pleasingly into the trials and tribulations of Donna Elvira. All those Elsas have not hurt her Mozart. William Burden’s Ottavio suffered from poor legato and some clunky phrasing, but the tenor’s golden timbre compensated. Three principals reprised their roles after a short, brilliant run two years ago under Constantinos Carydis. Erin Wall’s top-heavy Donna Anna shimmered attractively in the highest reaches. She properly gauged her part in ensembles and added luster to both finales. Animated to the Nth degree, Alex Esposito appeared to relish his turn as a Stanley Tucci-like Leporello. His lyric bass made up in focused sound for what it lacked in size. Gerald Finley sang a suave burlador and comically aped Esposito’s theatrical excesses. Twenty years into his career, Finley’s voice retains agility and plush tones, and yesterday the clarity of his Italian was unmatched. The pairing with Müller resulted in a truly seductive Là ci darem la mano. Tareq Nazmi and Stefan Kocán took the supporting roles of Masetto and the Commendatore, Nazmi with dramatic flair, Kocán with welcome resonance. Rough playing marred the overture, as did the immediate distraction of the curtain going up. Still, Fischer secured a generally fine effort from the orchestra at brisk tempos. The finales cohered brilliantly. Moved up and away from 17th-century Spain, where social strata empower Don Giovanni and restrict his victims, Kimmig’s action unfolds without policed context amid present-day cargo. Here the anti-hero incredibly gets his way using money and wits alone, when any one of the hardened locals — the ladies not excepted — might easily beat the powder-snorting crap out of him. Dark freight containers tirelessly twirl and slide, their doors and panels opening to reveal ugly, cramped mini-sets. This entry was posted on Saturday, May 4th, 2013 at 2:34 pm	and is filed under Munich Times. You can follow any responses to this entry through the RSS 2.0 feed. Both comments and pings are currently closed.